CoverSupermarket was originally formed in October 2005. 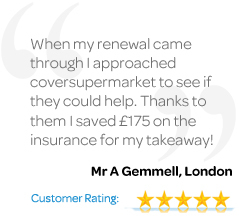 CoverSupermarket are online insurance brokers. Our aim is to provide you with online insurance quotations via our select panel of UK Insurance companies offering you the most competitive premiums available together with the best possible cover. We operate over the Internet enabling us to deal directly with you and the direct delivery of our products makes us unique to our customers, it enables us to reduce costs by providing a fully automated underwriting and quotation process. This ensures that ultimately you the customer benefits from reduced premiums whilst still enjoying the highest levels of customer service. In addition we will contact all of our customers by telephone to ensure that personal contact is maintained and in addition you may obtain quotations by calling us where one of our account handlers will be only to happy to assist. We offer a range of bespoke package products to a wide range of private & business sectors including: private car, household, retailers, pubs, restaurants, offices, contractors, hotels, manufacturers, wholesalers, property owners, motor traders and commercial vans. Additional products continue to be added to the range constantly.